Hurley Elementary student Lex Posada and his classmates work on reading and pronunciation in Spanish with kindergarten bilingual teacher Yesenia Hinojosa. The school is one of five that's adding a dual language program. When Dolores Cupp told parents at Hurley Elementary that the West Lawn school planned to launch a dual language program, she immediately saw a big spike in kindergarten enrollment—even before the program got started. Nearly all of the students at the Southwest Side school are low-income and Latino, and nearly a third are still learning English. Parents believed a dual language program would help their children preserve their Spanish skills—which usually taper off by 8th grade—and give them bilingual skills that would give them an advantage in today’s global job market. Hurley is one of five elementary schools that were chosen to launch new dual language programs, at a time when many communities across Chicago and the country are lobbying to replace traditional bilingual programs that emphasize learning English. Instead, dual language programs teach students in both English and a second language—in this case, Spanish. The new push coincides with CPS’ adoption of a new policy that formally recognizes that students’ home languages and cultures are “assets” to be built upon while they acquire English skills. Plus, Illinois has launched a statewide effort to recognize high school graduates who demonstrate proficiency in English and one or more languages by awarding them with a “seal of biliteracy” on their transcripts. In the past, top CPS officials were more focused on getting non-English speaking students to become proficient in English, which made dual language programs a tough sell. 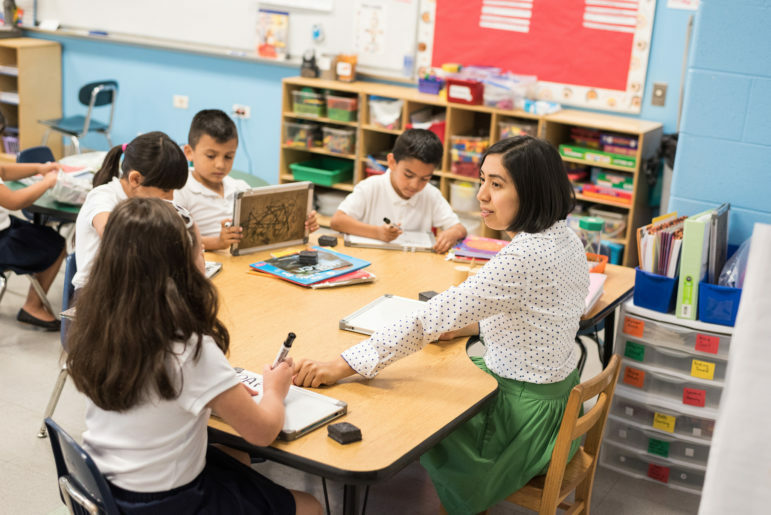 But “this time around, it appears there is a commitment that’s coming from higher up,” says Sonia Soltero, an associate professor in DePaul University’s College of Education who has consulted with CPS on dual language. Along with Hurley, the other four schools chosen to launch programs are Azuela, Moos, Mozart and Spry. The schools will receive teacher training and a half-time coordinator paid for with federal funds. By the time the new initiatives launch in the 2017-18 school year, Chicago Public Schools will have 20 such programs, with nine in neighborhood schools, three at magnets and three at charters. But there are serious questions about how the district will sustain these programs, though district officials maintain that the Office of Language and Cultural Education has the necessary resources, including a specialist to oversee all 20 programs. Already, parents at one dual language school, Linne Elementary in Avondale, say the program could be on the chopping block. And Karen Garibay-Mulattieri, the former chief for the Office of Language and Cultural Education, is among those who fear that the district’s cuts will undermine progress. As chief, she spent as much as 30 percent of her time helping dual language principals, but shared her responsibility with a deputy—whose job has been eliminated. Meanwhile, funding from The Chicago Community Trust that paid for some teacher training ended this year. And schools can have a hard time attracting and keeping teachers who have the necessary skills in both English and Spanish, who can easily find more lucrative jobs in suburban schools. In fact, while Chicago’s Inter-American Magnet school in Lakeview has one of the oldest dual language programs in the country, the district has long lagged behind suburban districts in supporting the model. In the late 1990s, under then-CEO Paul Vallas, some 30 dual language programs were launched. But without the proper support, very few survived after three or four years, Soltero recalls. The district tried again a decade later with a smaller group of schools and funding from the Trust and the federal stimulus package. Those programs survived. “It’s better to start with smaller numbers that can have deeper support so they’re sustainable,” Soltero says. In more affluent, suburban districts, dual language programs are often viewed as a way to help children who are learning English while also attracting middle- to upper-class families who want their children to learn a second language that will help them in the job market. Judith Yturriago, who helped start Evanston’s dual language program 16 years ago, says that state money (which could be used for dual language or traditional programs), the potential for helping English-learners raise their achievement and the chance to have more integrated classrooms were selling points for parents. Soon, homes near a dual language school became a hot commodity. “[We] used to get calls from realtors who had clients that wanted to move into the dual language school boundaries,” Yturriago says. In Chicago, most of the 20 schools that will have a recognized dual language program serve predominantly low-income Latino students with a higher-than-average proportion of English-learners. Most are on the West, Southwest and Northwest sides of the city. Community groups in Logan Square, Humboldt Park, Little Village and Pilsen have all pushed to expand dual language. Garibay-Mulattieri, who is now the education manager at the Latino Policy Forum, says Chicago is unique because community organizations championed the concept quicker than CPS itself. Kindergarten bilingual teacher Yesenia Hinojosa works with a small group on pronunciation and spelling in Spanish at Hurley Elementary. Several of the schools getting new dual language programs prepared for months, or even years. Leticia Barrera, a Logan Square Neighborhood Association education organizer, says parents from nine area schools worked for two years, surveying other parents about their interest in dual language and then meeting with principals, local school councils and CPS administrators. In Logan Square, Mozart is slated to launch one of the new programs. In the West Town/Humboldt Park community, the staff at Moos Elementary researched and toured other dual language schools for over a year and even created a video to explain the concept to parents. Not all parents, especially newer immigrants, understand how dual language differs from traditional bilingual classes. That means parent education campaigns are crucial to spreading the model. After holding focus groups this fall, Juan Cruz, an education organizer at Communities United, says his group found that many parents didn’t know the difference. “The parents who wanted their kids in a bilingual program were [actually] talking about a dual program,” he says. Communities United lobbied for a new program in Belmont Cragin or Albany Park, but didn’t get one. 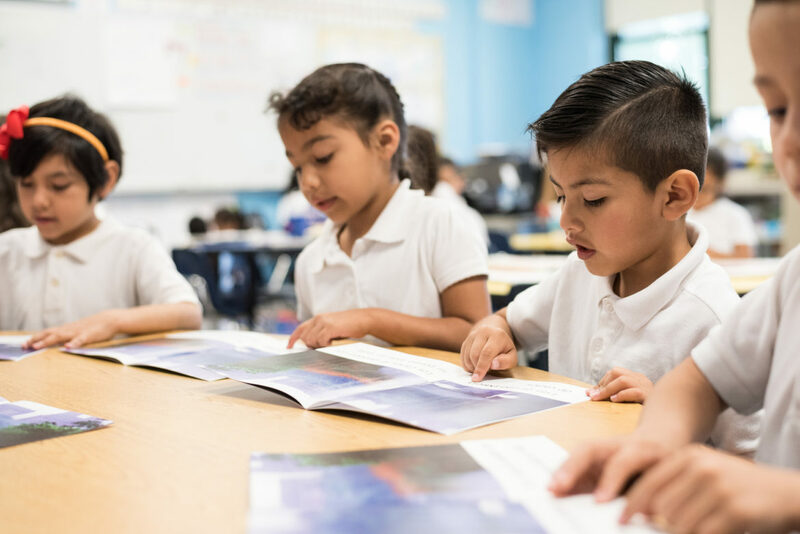 Many bilingual programs are violating state law by failing to provide adequate services to the district’s growing share of students whose native language is not English. Muchos programas bilingües no cumplen la ley porque ofrecen servicios inadecuados al creciente porcentaje de alumnos cuyos idiomas natales no son inglés.